On the 31st December 1992 the Manual Handling Operations Regulations came into force. These regulations apply to any task which involves moving a a patient or resident, and sets out a series of duties which are placed on the employer and employee. Principally they are as follows. Avoid as far as possible, the need for moving people which involves the potential for risk of injury. Mechanise any tasks to prevent moving people. Assess any hazardous manual handling operations which cannot be avoided. The assessment should include consideration of four main areas; Task, load, individual and environment. Reduce the risk of injury resulting from moving people as far as possible. Singleton Training Services Ltd offers a comprehensive training service in relation to manual handling of people, for all levels of staff. Our clinical training course is 6 hours; it consists of both theory and hands on practical sessions. Types and frequency and cost of handling injuries. Risk assessment applied to moving people. Control measures in moving people. Practical demonstration of moving people. Practical demonstration of lifting equipment in the home. Explain what is meant by moving and handling. Explain how moving people can cause injury. State the principles for controlling moving people in a practical context. Demonstrate a basic understanding of the Manual Handling Regulations. 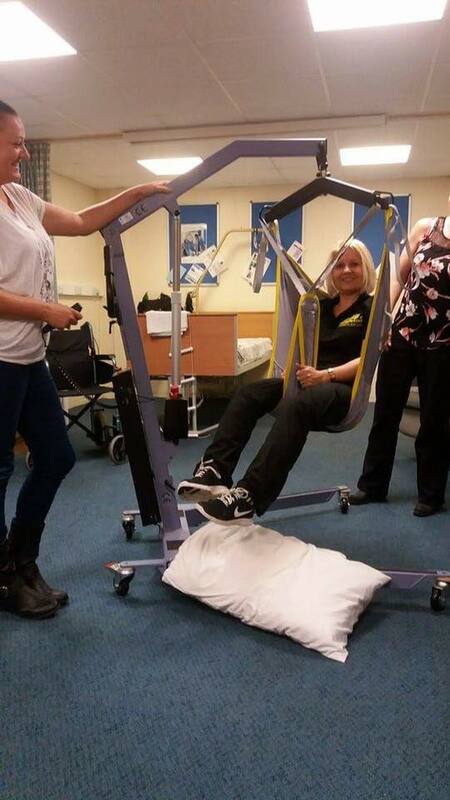 Demonstrate the ability to lift safely using lifting equipment. Click here to download moving & handling syllabus.